We found 10 episodes of Do Life Better Podcast with the tag “work”. What’s your dream goal? Have you started working towards making it a reality, or is it still only in the dream stage because it seems too difficult? Last weekend, I turned one of my long-term dreams into a reality by finishing my first marathon. The training and race day were perfect opportunities for me to use many of the strategies we’ve shared on this podcast and to test them out in a fairly extreme situation, well extreme for me anyway! Maybe your dream isn’t to run a marathon, instead it might be to get a promotion, start a business, get that job, be accepted into your degree or something else. You have what it takes to do hard things by turning those dreams into goals and then into reality. You just need to take the right steps - physically and mentally. In this solo round, I share with you the strategies you can use to turn your dreams into a reality. What does a good, full life look like to you? There are specific things you can do to make this a reality. In this episode, Dr John Barletta and I chat about the deliberate things you can do create a good, full life. I’ve been looking forward to bringing you today’s episode with Dr Rick Hanson ever since we organised the interview. I first heard of Rick a couple of years ago on the School of Greatness podcast with Lewis Howes, and his messages have helped me create a lot more happiness, self confidence and resilience in my every day life…and I know it will help you too. In fact, our earlier episode on savouring was inspired by what I previously learnt from Rick. In this episode, Rick will help you overcome the brain’s negativity bias, release painful thoughts and feelings, and replace them with self-compassion, hope, and inner peace. He will also show you how to turn your everyday experiences like the warmth of a friends smile or a pleasant meal, into lasting inner strengths which become hardwired into your brain, such as resilience, balance and positive emotions. What was your response the last time someone asked you, “How are you?”. The words you used influenced you and the person you were speaking with, and it could have given a powerful insight into your mindset, attitude and mental state. Words are more than just words, they create your reality. After all, the way you interpret the world around you is through your internal dialogue. Each and every encounter you have with someone is an opportunity to leave them feeling better for spending time with you. The words you use play a large role in creating this positive influence. In this short solo round, I’ll dive into the power of your words and the importance of choosing your words wisely so they uplift and empower you and those around you. Have you ever wanted to create a greater sense of balance in your overall wellbeing, but weren’t sure how or what to monitor and change? Are you wanting to perform at your peak, but struggle getting there consistently? Today’s guest can help you. Annie Flamsteed is a young entrepreneur who’s turned her experience of the ups and downs that come with being a high performing athlete into a business designed to help young athletes perform at their peak, not just in the arena but all aspects of their life. Whether you are an athlete, business person, student, or anyone else trying to do your life even better, this chat with Annie is full of tips and strategies that will help you perform at your best. So, I hope you enjoy this chat with Annie Flamsteed. What if this moment right now is the most important moment of your day? After all, this is the only moment you can change, is full potential and has countless options, if you choose to see it and grasp it. This moment right now is so important because you can also use it to determine how you show up for what ever is coming next - if you stay in a stressed state, you will show up even more stressed. However, if you go into a state of bliss, peace, calm and gratitude, you will carry that with you into where ever you are going next. During this episode, I share with you some habits for making the most of each moment and increasing your presence. I also take you through a quick exercise for helping you to become truly present and grateful especially during times of worry, stress and anxiety. Do you ever feel like quitting because it all seems too difficult? During these moments, the set backs can feel like they keep taking you further and further away from succeeding, so giving up becomes very tempting. Sound familiar? I’ve been there too. Yet, we all know of people who, despite the biggest obstacles, keep moving forward with hope, motivation and a sense of perspective. Maybe, you are like this too. What’s the difference? How come some people are able to move forward in the face of adversity while others crumble? It’s not about skill or intelligence, instead it’s your grit and resilience that counts. You are stronger than you would ever imagine, especially when you practice the right habits. 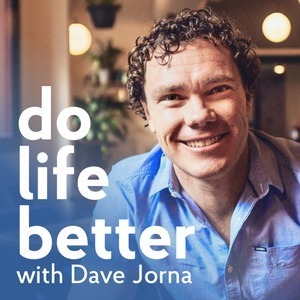 In this episode, the Do Life Better podcast’s resident psychologist, Dr John Barletta, and I share strategies and habits for building your grit and resilience to help you move through challenging moments with greater positivity and purpose. A number of years ago, I created my morning routine and it changed me. The way you start your morning influences everything that happens that day. Or at least, the way you interpret the events during your day and what you do next, which ultimately leads to your outcomes. It can be the difference between you being sluggish, unmotivated, unproductive, foggy and reacting to everything that happens, or it could enable you to be switched on, focused, positive, motivated, highly productive, present, intentional and help you respond positively to all that comes up in a way that is in line with your values. I believe that we need to get ourselves ready in the morning from the inside out. The majority of high performers in all fields claim that their morning routine is a key to their success. Change your morning, change your life. In this solo round, I’ll share with you the elements of morning routines used by many of the world’s highest performers. Have you ever tried showing a loved one, friend or family member how important they are to you but it just doesn’t seem to work? Or, have you ever found yourself wondering if they really care for you as much as you’d like because you’re just not feeling it, or because it seems like they’re not doing the things that you think are the signs of love. What if they have been showing you love but you’ve been missing it? And, what if you’re attempts to show others love hasn’t been working the way you want it to because they’ve been missing it? Today’s guest has the answer. Dr. Gary Chapman is the author of the 5 Love Languages which has been a New York Times bestseller for 8 years straight and has sold over 12 million copies. Through his work, Dr. Gary Chapman has helped millions of people restore marriages, families and relationship across the world by helping them understand the different ways love is expressed and received. In this episode we share the ways in which you can transform your relationships. Sometimes, I think we get it wrong when it comes to saying, "Thank-You". I know that sounds strange, but it's true. We often get something so simple, like expressing our gratitude, wrong. In fact, saying it incorrectly can lead to a reduction in motivation, learning and performance. That's right, it can have an opposite effect to what you are intending. In this solo round, I'll share with you the ways you can make a greater positive impact simply by saying a more powerful "thank-you".